Welcome to the Wilbert Paige Memorial tournament! 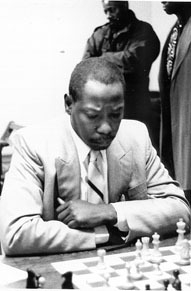 NM Wilbert Paige, a Philadelphia native, first gained a serious interest in chess while attending West Philadelphia High School and played from 1975-77 on the chess team with his close friend, NM Glenn Bady. Both Wilbert and Glenn met in the lunchroom where other chess players "hung out." Despite his calm, unassuming demeanor and his preference for positional play, he was known by chess players as "evil" because of the brutality he dished out over the chess board. NM Bady asserts that Wilbert would often silence those who doubted he could excel at blindfold chess. In fact, Wilbert could play as many as four blindfold games at a time! The distinguished picture on the right was taken at the 4th African-American Unity tournament held in the spring of 1992 where he tied for second with NM Ernest Colding. That tournament was won by the late NM Mark Meeres and was the last of four historic tournaments organized by FM (now GM) Maurice Ashley. Wilbert often led a contingent of Philly masters to New York to take on some of the "Black Bear" masters. It seems appropriate that Wilbert played in the last Unity tournament as he is now the inspiration for ten Black masters from around the world getting together to engage in battle. Your spirit lives Brother Paige!! See Paige-IM Ed Formanek, 1993 World Open, 1-0. Find out how you can order a historic account of this historic tournament. A value at only US$10.00, this 64-page collector's item has more than 60 photos, annotated games, round-by-round commentary, and more! To order your personal copy, or find out about organization discounts, click on the booklet image for details!! Copyright © 2001 by Daaim Shabazz. All rights reserved. The content contained on each page of this website may not copied or electronically transmitted without the expressed consent of the author. Photographs identified as property of Jerome Bibuld should refer to his copyright page for use privileges.